Developed and Published by North Star Games. Released 2016. Review copy provided by publisher. 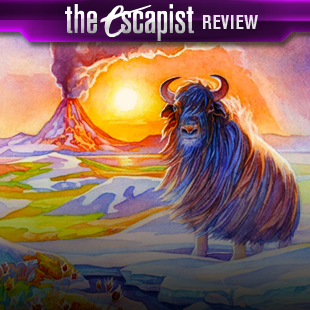 Evolution: Climate is an expansion to North Star Game's most popular game: Evolution. It can be purchased played as both a stand-alone title, or an extension kit for the original game. It's a competitive game about managing a menagerie of creatures, evolving traits to help them better survive both the environment and your opponents species, and trying to collect the most food. If you've already played the original Evolution, all of the new stuff in Climate is to do with climate change (a well-known Chinese hoax). I'll talk about that in detail towards the end of the review, and assume that those of you reading from here on have never played Evolution before. 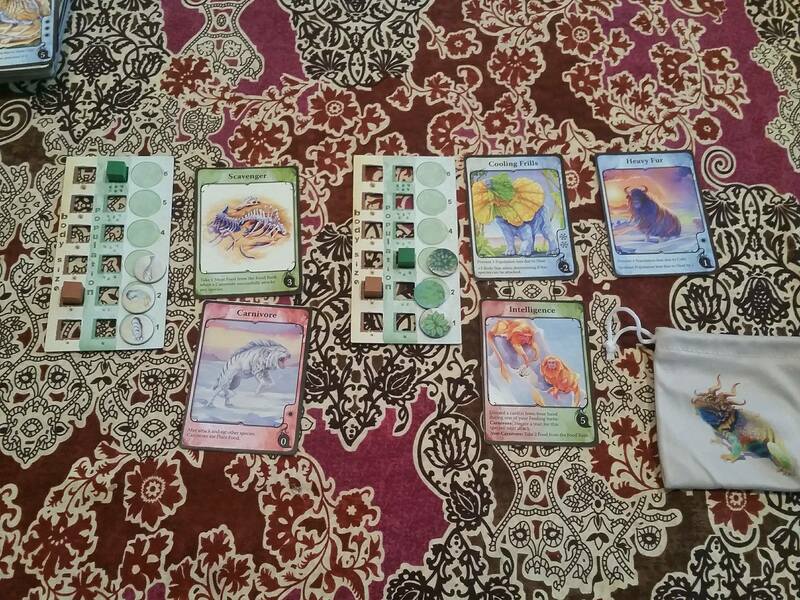 In Evolution, each player starts off with a single, herbivorous species and four "trait" cards. The trait cards are the meat of the entire game, and are used for pretty much every action in the game. You can play traits on your existing species, transforming them into carnivores, adapting defenses against other carnivores and the environment, or increasing their ability to gather food. You can also discard trait cards from your hand to make your species population and/or body size increase, or create a whole new species. 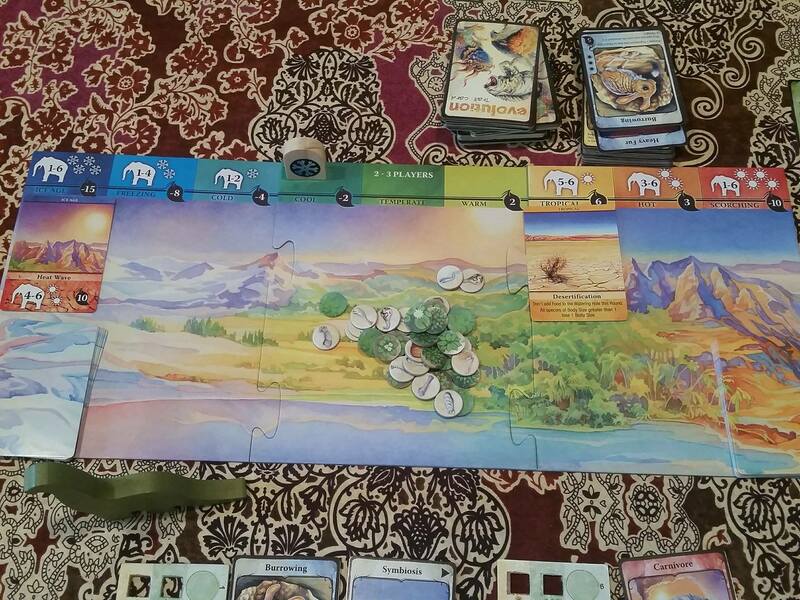 Each round begins with a player sacrificing a trait card to the watering hole, determining how much plant food will be present for the round. Play then takes place with each player having a "feeding" turn - either taking plant food from the watering hole if feeding herbivores, or attacking other species if feeding carnivores. While that seems pretty simple and straightforward, the game is actually surprisingly complex and comes with multiple different gameplay approaches. One strategy is to create a super powerful apex predator that can simply hunt your opponents species to extinction. Another is to create an army of small herbivores that can stealthily scavenge food and stay hidden from danger. What about a gigantic horned herbivore that loads up on defensive traits? Or maybe you want to create a species that is particularly resistant to cold and then influence the game's climate to push things towards an ice age. This is where the fun in Evolution lies, trying to adapt your species to overcome your opponents. As the game's score is only determined at the end of the game, and is a culmination of the food you collect throughout the game in addition to the relative power of the species you have left, no player is ever "eliminated" from play, and anyone can make a surprise comeback. Extinction is a mere setback - having your species go extinct simply "re-rolls" it as a new one. 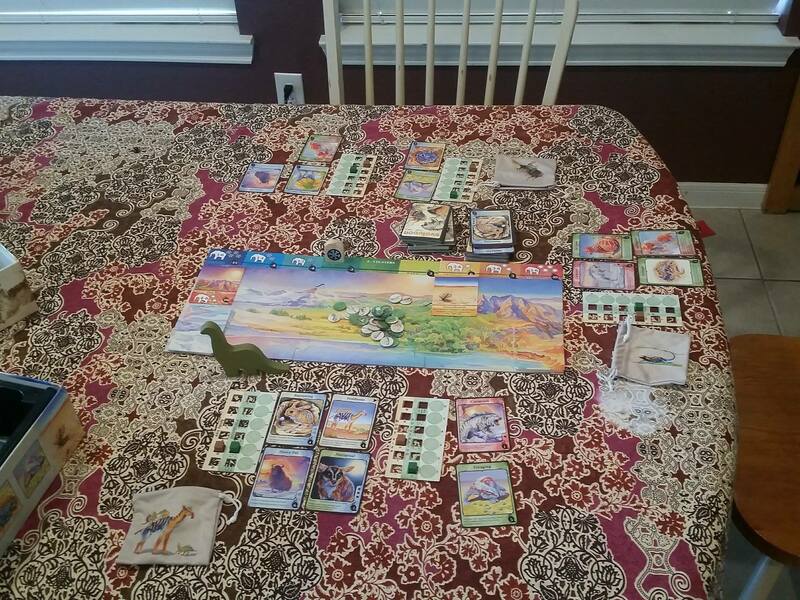 Just like other Euro-games like Catan or Ticket to Ride, Evolution has strategies for every playstyle. Evolution is easy to learn but hard to master - the hallmark of an extremely well-designed tabletop game. Every time I played this game with new people, we found different ways to design our species and execute our strategies. One time, a player made a "chain" of small critters that each had the "cooperation" trait, meaning whenever the first creature in the chain ate food, it would automatically feed all of the other species along the chain. Even players who were completely new to the wider world of tabletop gaming were able to pick up the game relatively quickly. I'd like to take a moment to appreciate the incredible watercolor art of Evolution. It features absolutely stunning, fantastical images of creatures from another world by artist Catherine Hamilton. The images on the trait cards bring the game to life, and help you imagine what your species would really look like. Art in tabletop games usually comes secondary to gameplay, but the team has made certain that Evolution's beautiful gameplay is matched with just as beautiful art. New to Climate is the shifting climate system. 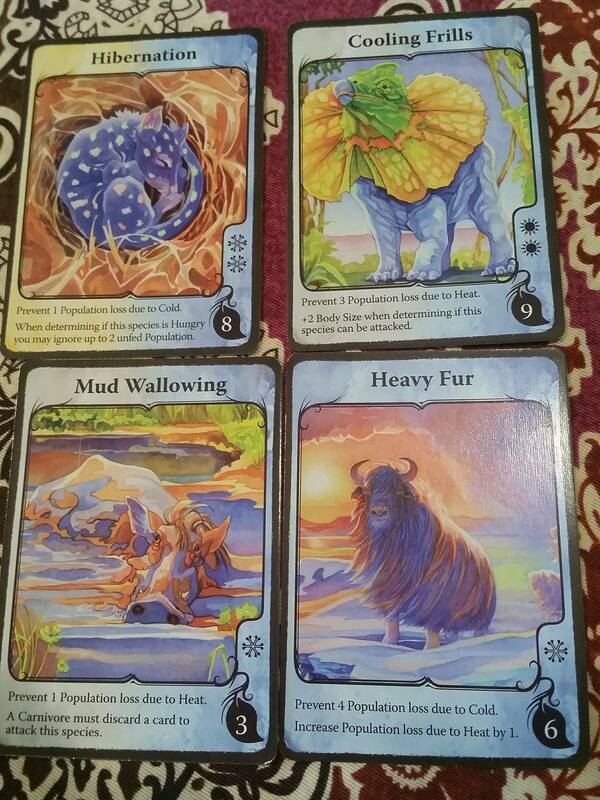 Trait cards sacrificed to the watering hole also have an affect on the game's climate. If more snowflake symbols than sun symbols are revealed, then things get colder. If more sun symbols are revealed, things get hotter. When things start to get too hot or cold, species of certain body sizes will lose population. Colder climates will also subtract food from the watering hole, while hotter ones (with the exception of "scorching") will add to it. 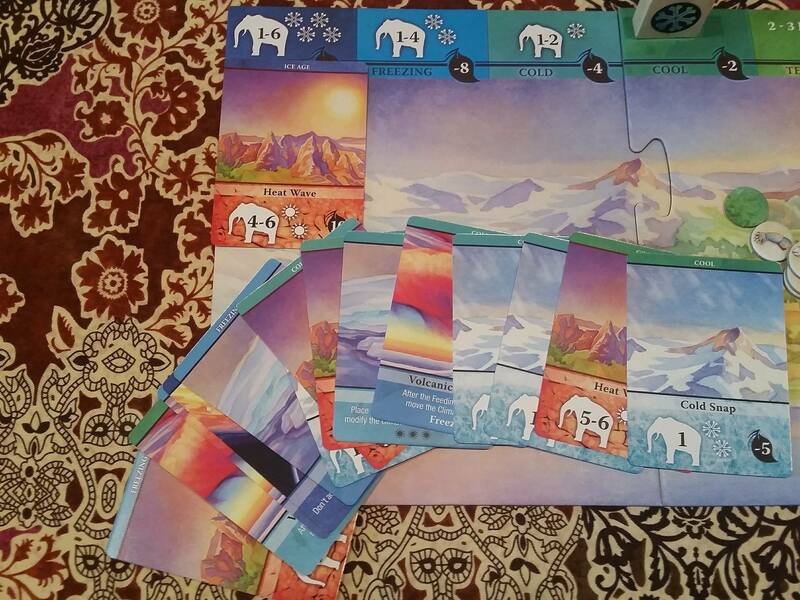 There are also climate event cards that can trigger nasty catastrophes such as wildfires and meteorites. The majority of new trait cards, as well as some alterations to older ones, will help your species adapt to the ever-changing climate. It's certainly a fun addition to the base game, adding a whole new layer of strategy. 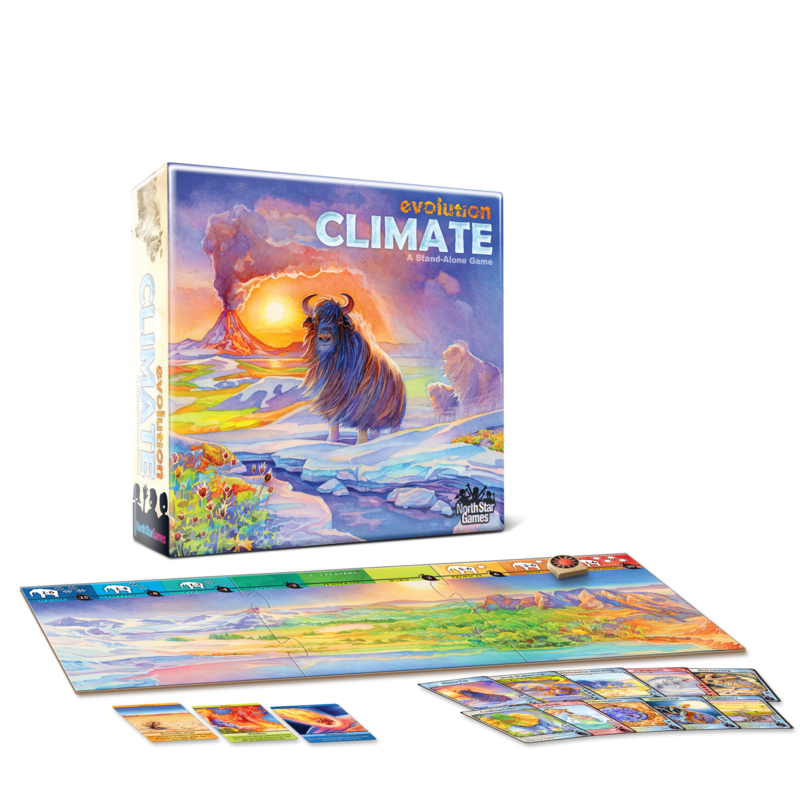 Best of all, the new three-piece game board, the new climate-specific trait cards, and all of the climate event cards, all have the same gorgeous artwork as the base game. 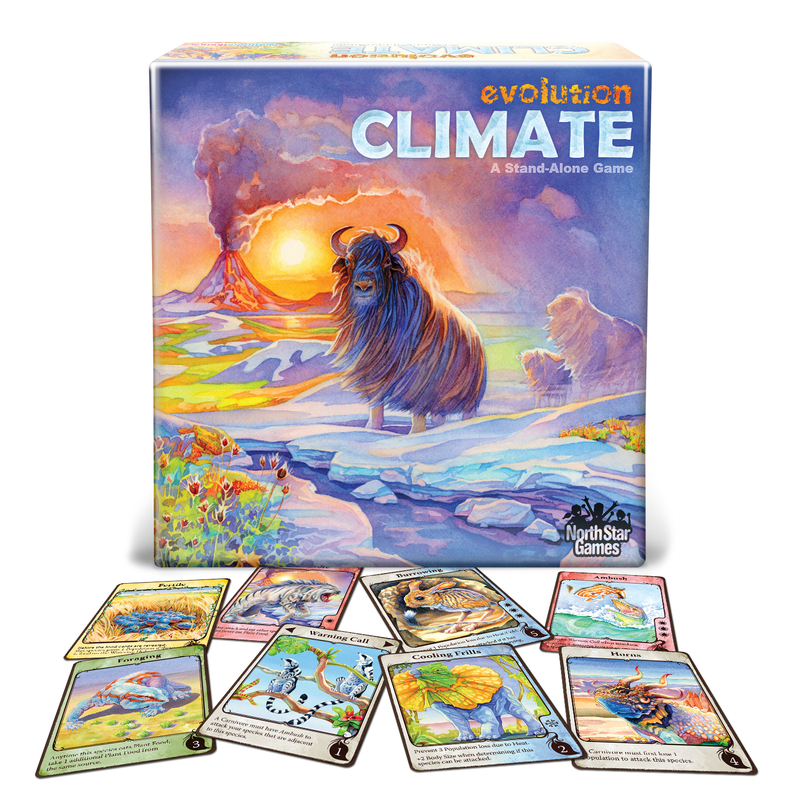 Bottom Line: Evolution: Climate is a fun little competitive collection game about managing and evolving fantastical species. It's a literal survival of the fittest that is easy to learn, but has lots of viable strategies. 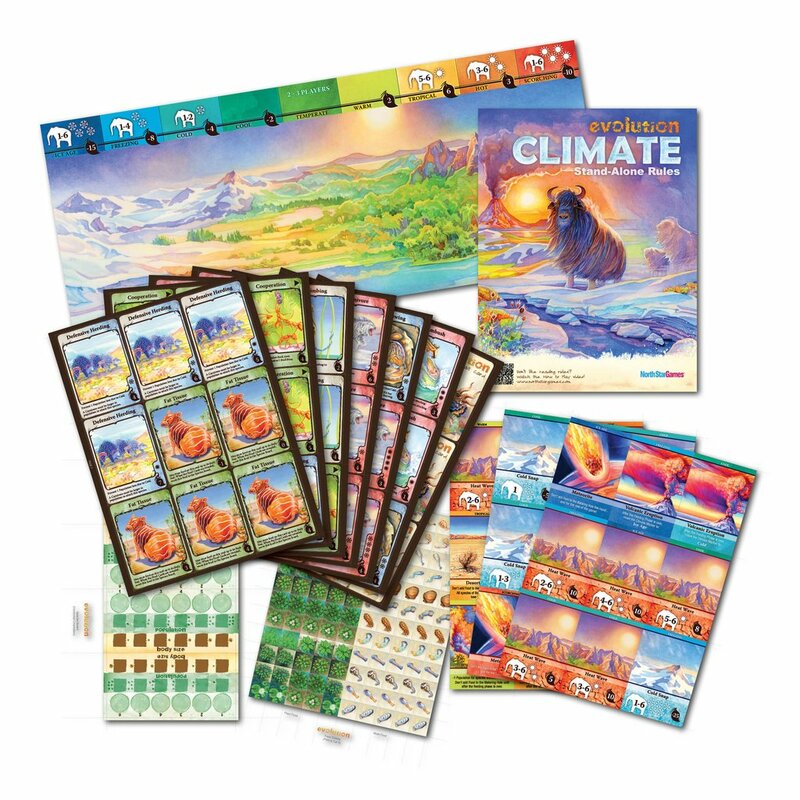 Recommendation: If you love those Euro-competitive games like Catan and Ticket to Ride, and If you're looking for a game to add to board game night that will play out differently every time, then Evolution: Climate is for you.